There are million different places you can go for a Seattle getaway, but one of the best options is waiting for you north of the border. 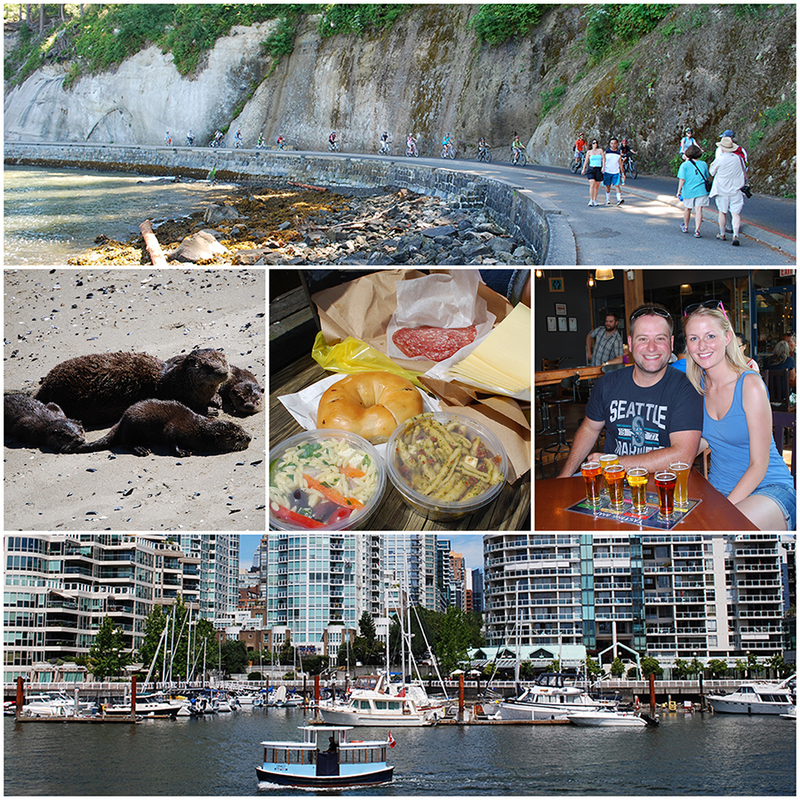 Tove and I just wrapped up a four day, five night stay in Vancouver, British Columbia. 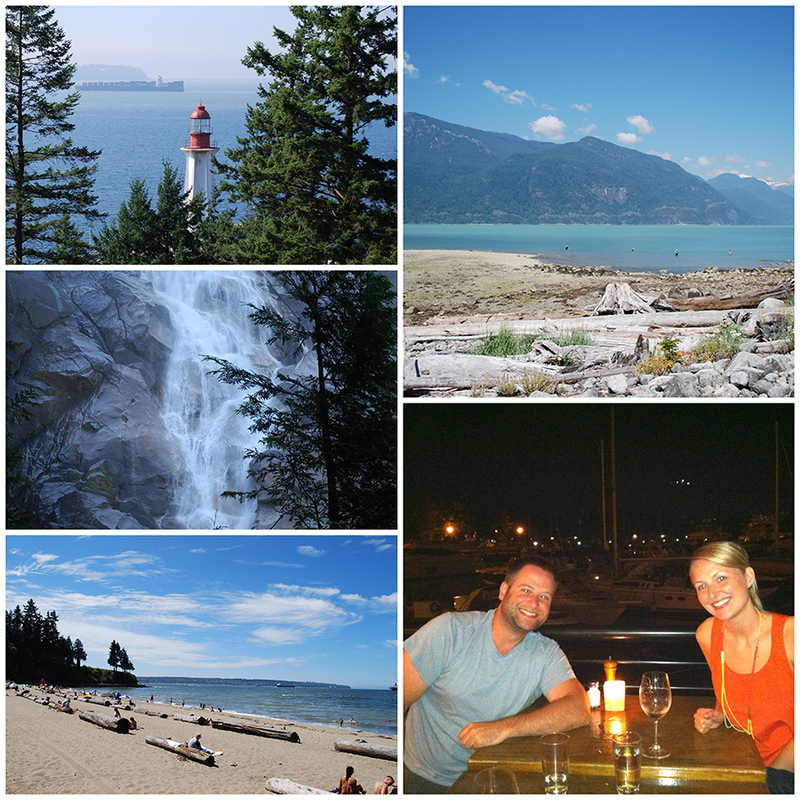 We both grew up in the Northwest and traveled into Canada quite a bit when we were younger, but this was our first extended trip to Vancouver as adults. I want to mention a couple quick notes before I get started: Tove and I stayed at Coast Plaza Hotel and Suites in the West End (thanks to a screaming deal from Hotels.com). The hotel was located minutes away from Stanley Park and close to several bars, restaurants and beaches in the neighborhood. We mostly adventured around on foot, but since we drove from Seattle to Vancouver, we had access to my car for farther trips. Are you ready? 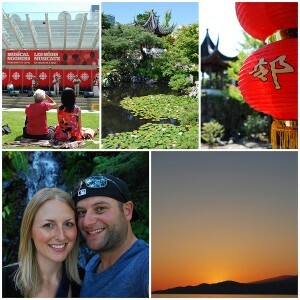 Here’s the breakdown of our four days of fun in Vancouver! We started our first full day in Vancouver walking along the entire Stanley Park seawall. We continued our walk through English Bay Beach and Sunset Beach. Tove and I then hopped onto the False Creek Ferry to Granville Island. We roamed the aisles at the public market and collected food for lunch. We enjoyed our meal on one of the island’s piers, overlooking downtown Vancouver. While on Granville Island, we also checked out the shops and stopped into Granville Island Brewing for some beer tasting. From there, we took the ferry back to downtown and walked across the city to Canada Place. After taking in the views there, Tove and I hopped on the SeaBus to North Vancouver. We soaked in the views of the Vancouver skyline from North Vancouver and roamed the neighborhood before heading back across the Burrard Inlet. 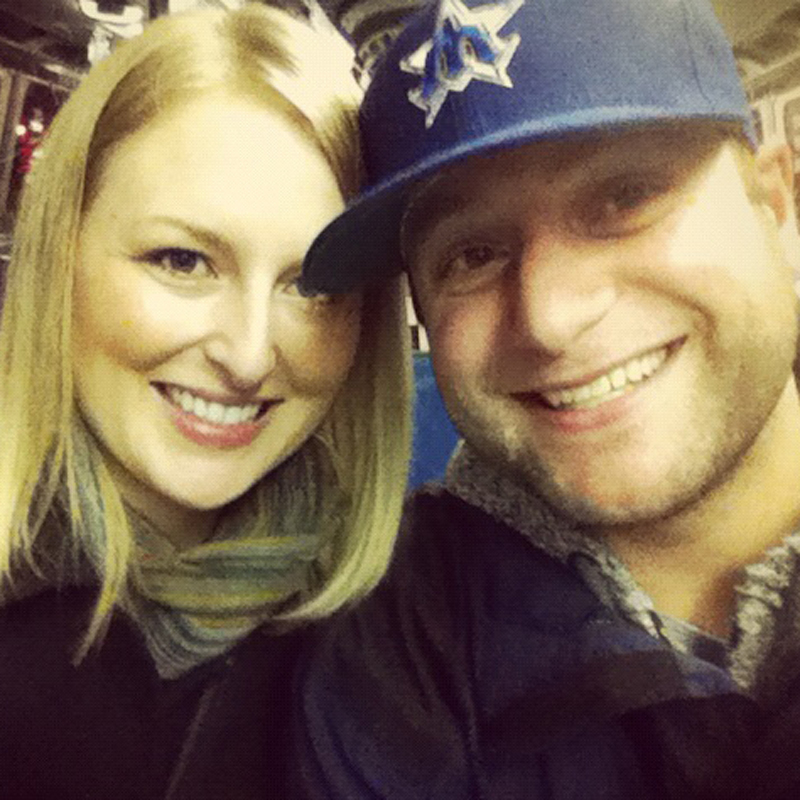 Once we were back downtown, we made our way to the Yaletown neighborhood for dinner. After our meal at Hub, we walked back to the hotel along the waterfront. 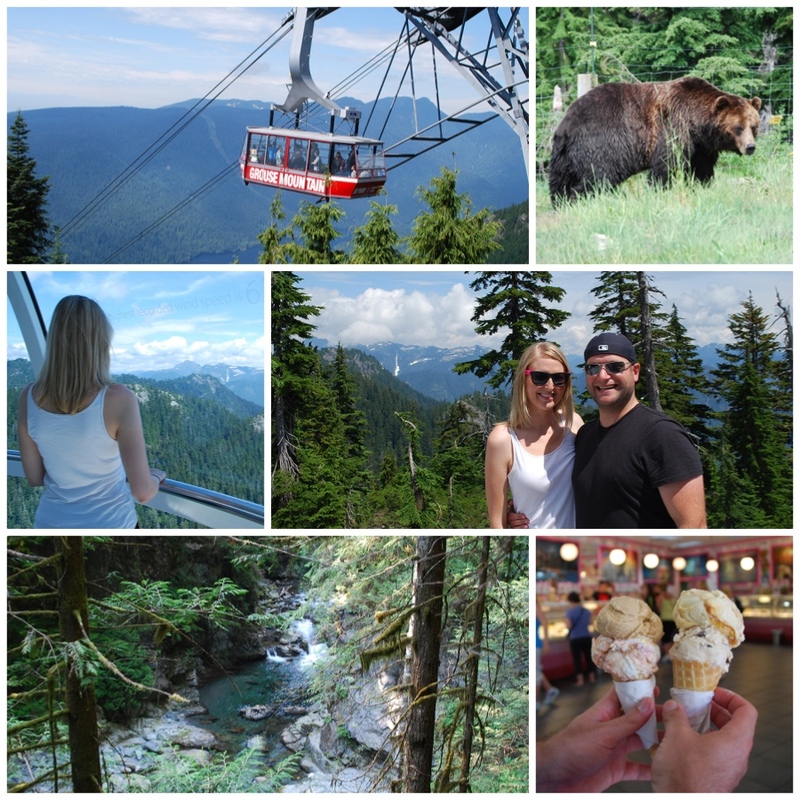 On our second day in Vancouver, Tove and I made the 15 minute drive to Grouse Mountain (yes, the mountains are that close to Vancouver). We enjoyed the Skyride to the Alpine level where we saw the mountain’s two grizzly bears (enclosed in a refuge) and watched part of the lumberjack show. After that, Tove and I took the chairlift to the Peak level and rode the elevator up the Eye of the Wind. After taking in the incredible views from more than 4,000 feet above Vancouver, we went back to the Alpine level to watch the Birds in Motion show. From Grouse Mountain, we drove to Lynn Canyon Park and hiked around for about an hour, crossing the Lynn Canyon suspension bridge along the way. After our hike, we drove to La Casa Gelato and taste tested their 218 flavors of ice cream. Tove and I then wandered around Chinatown before heading to Richmond for a traditional Chinese dinner at Empire Seafood Restaurant. After dinner, we drove to Hadden Park to see the Vancouver skyline at night. On our third day in Vancouver, Tove and I strolled along the Robson Street shopping district before randomly running into a live concert by Los Vega at the Musical Nooner outside CBC Vancouver. After the show, we strolled to Dr. Sun Yat-Sen Classical Chinese Garden. After exploring the garden, we walked to the Gastown neighborhood. We window shopped before heading to Peckinpah for some Carolina style barbecue. Tove and I took our food to go and posted up at Portside Park for lunch. After eating, we walked along the Coal Harbour waterfront and then chilled at Lost Lagoon in Stanley Park. We cleaned up at the hotel before driving to Queen Elizabeth Park. After walking around the beautiful park, we drove to Spanish Banks Beach Park and watched an incredible sunset. We then drove to the Kitsilano neighborhood for sushi at Hi-Nippon. We ended our night at The Three Brits in the West End for an evening drink (or two). We woke up early on our fourth day in Vancouver and hopped in my car to explore the Sea to Sky Highway. 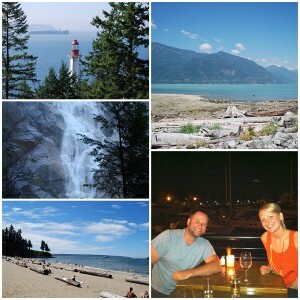 The road takes you along Howe Sound and provides incredible views of the water and mountains. We made stops at Lighthouse Park, Whytecliff Park, Shannon Falls, Squamish, Furry Creek and Britannia Beach along the way. Shannon Falls was our favorite spot, but Furry Creek was a close runner-up. Tove and I stopped there for lunch (which we bought at a grocery store in Squamish), and enjoyed our meal on the beach. After returning to Vancouver, we walked back to Stanley Park. This time, we hiked through the park and ended up at Third Beach. We spent the late afternoon and early evening chilling in the sun and swimming in the bay. After walking back to the hotel, we strolled across town to Cardero’s. We sat on the patio overlooking Coal Harbour Marina and enjoyed a great meal and stellar service. It was the perfect way to end our trip to Vancouver. Before we left on our adventure, I was a little concerned Vancouver would be just like Seattle (since its only about three hours away). While there were several similarities, Vancouver has its own unique vibe. It’s diverse, loaded with great bars and restaurants, and it has plenty of awesome activities and entertainment. 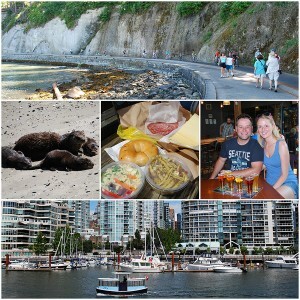 We had the luxury of spending four days in Vancouver, but you can easily spend a nice weekend there as well. The city changes throughout the seasons, so Vancouver is an entirely different experience in the summer than it is in the winter. We can’t wait to go back for a Vancouver Canucks hockey game and possibly some snowboarding at Grouse Mountain and/or Whistler once the weather turns. No matter what time of year you visit, just be sure to make the trek to Vancouver at some point. It’s a beautiful city full of some of the friendliest people we’ve ever met. There’s one thing we know for sure — you won’t get bored in Vancouver. There are a million things to do and see, so every trip up north can be completely different if you want it to be. We know you have a lot of choices and limited time, but we highly recommend Vancouver for your next Seattle getaway. When is the last time you visited Vancouver? What is your favorite thing about the city? How about your favorite shop, restaurant, etc.? We’d love to hear from you! Leave a comment below or connect with us on Twitter, Facebook and Google+. Don’t forget to also check out Seattle Bloggers for more great getaways from the Emerald City!